* I recently went to an interesting seminar today by Matias Cattaneo from the University of Michigan. * He was presenting some of his work on non-parametric regression discontinuity design which I found interesting. * Regression discontinuity is a technique which allows identification of a localized effect around a natural or structured policy discontinuity. 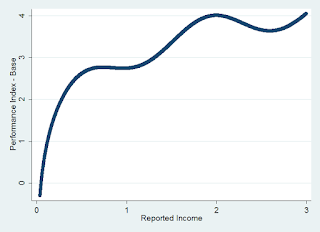 * For instance, if you wondering what the effect federal grants have on college attendance, then you may be concerned that just looking at those students who are eligible for federal grants in contrast with those who are not eligible will be problematic because students who are eligible (low income) may different than those who are not eligible for the grant (not low income). * The RD argument is that if individuals do not, as a response to the grant being available, move their reported income level to become eligible for the grant than those who are near the cut off for the grant and those not near the cut off will be fundamentally very similar. 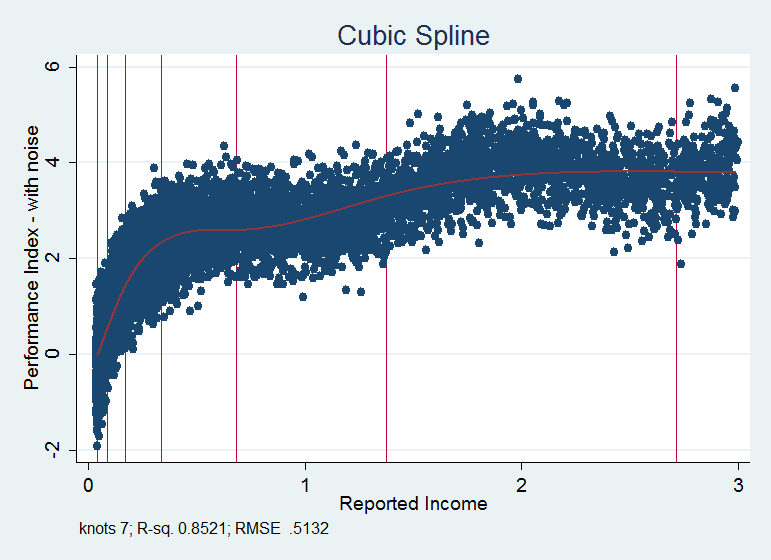 * This may occur if for instance the income cut-off for the grant is unknown. * So even if students are systematically under-reporting their income, they are not doing it aware of the actual cut off, so the students sufficiently close, above and below the cut off are arguably the "same" or drawn from the same pool except that one group received the program and another group did not. * The previous post deals some with assuming a linear structure of the underlying characteristics. 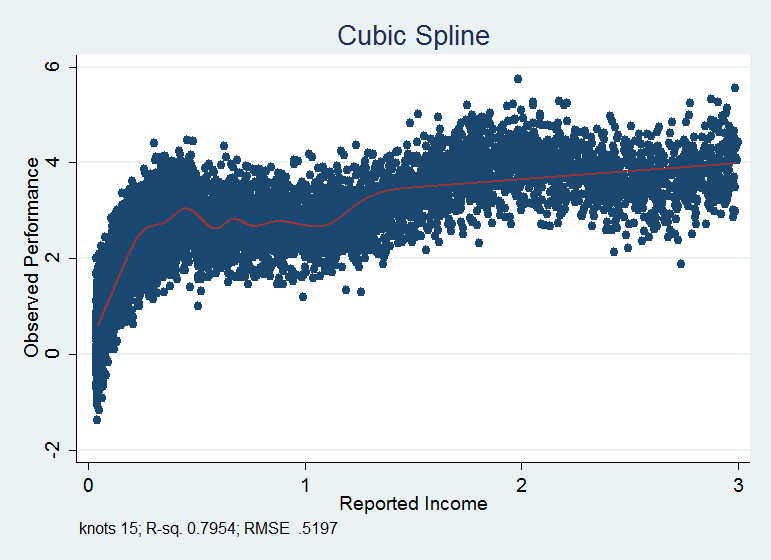 * However, the more interesting case (potentially) may be when we assume a nonlinear response to the income in our dependent variable. * But before going there let's think about what this method boils down to. * Like all identification methods in statistics or econometrics when we do not have experimental data, identification of an effect is driven by some exogeneity argument. * That is, x causes y and is unrelated to u (the error). In the case when u may be correlated with the error the use an exogenous variable to force the movement in the variable of interest may be sufficient to identify a causal effect. * In this case, clearly it is not enough to simply see what the average y response (GPA, attendance, graduation rates, whatever) is to a change in grant level because those who receive the grants are systematically different from those who do not. * However, because the cut off for receiving the grant is unknown, around the cut off the two samples who receive the grant and who do not can arguably be considered the same. * Thus, we could say that the unknown position of the cut off is the random exogenous variable which near the cut off forces some students into the group that receives the grant and some students into the group that does not. label var income "Reported Income"
label var perf0 "Performance Index - Base"
label var perf1 "Performance Index - with noise"
* Using the user written command rcspline, we can see the local average performance as a function of income. * I specify "7" knots which are the maximum allowed in the rcspline command. * The spline seems to fit the generated data well. * Now let's add a discontinuity at .5. * So about 50% of our sample is eligible for the grant. * Now let's add the grant effect. * First let's generate an income variable that is centered at the grant cut point. 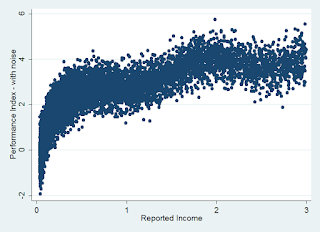 * Thus the grant is more effective for students with lower income. label var perf2 "Observed Performance"
* This is obviously not the ideal plot and I have had some difficulty finding a command which will generate the plot that I would like. * However, we can see that there does appear to be "something" going on. * We can see that our itial estimate of the effect of the grant is entirely wrong. * It appears so far that the effect of the grant on performance is actually hindering performance (which we know is false). * The default cut point is at 0. 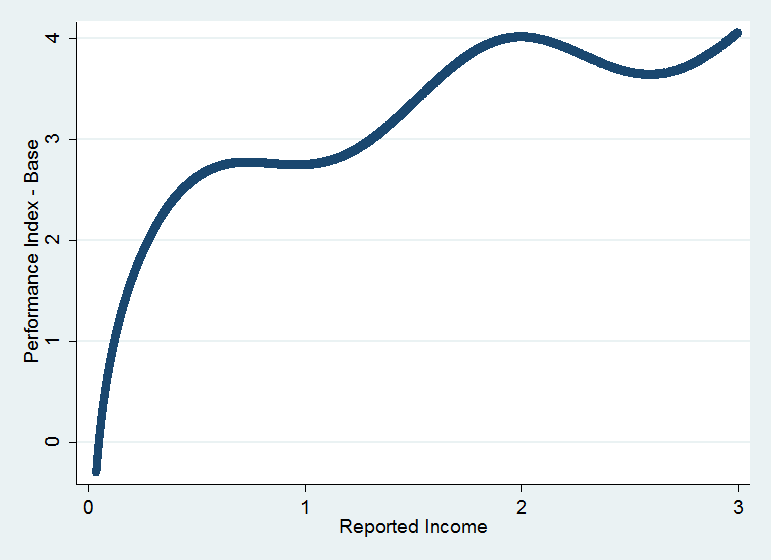 Thus using income_centered works. * Though this estimate is negative and thus seems the reverse of what we would expect, it is actually working quite well. * That is because regression discontinuity is trying to identify the effect of the discontinuity on the outcome variable with the default assumption that at the discontinuity the forcing variable is becoming 1. * In this case however, the discontinuity is really driving the grant to be equal to zero. * Thus we must inverse the sign on the rd estimator in order to identify the true effect in this case. * Alternatively, we could switch the sign of income. * rdrobust is a newly designed command that has some extra bells and whistles that other regression discontinuity commands have as well as some oddities. * This command is nice because it estimates many bandwidths through the mbw option. * The default mbw is "100 50 200" which means, use the 100 MSE (mean squared error) minimizing bandwidth, half of it and twice it. 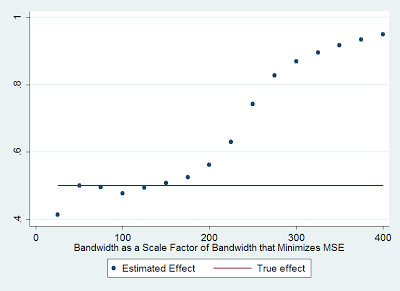 * We can plot our estimates of the treatment effect using a range of bandwidths. 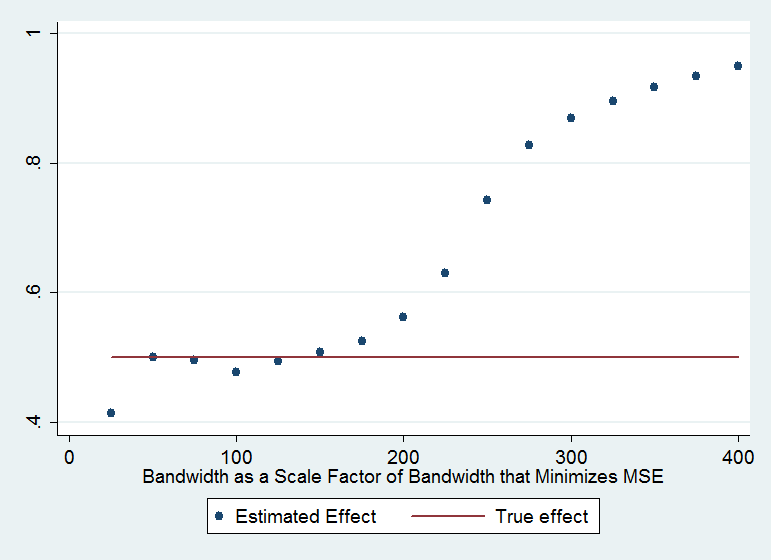 label var effect_est "Estimated Effect"
label var band_scale "Bandwidth as a Scale Factor of Bandwidth that Minimizes MSE"
label var true_effect "True effect"
* We can see around the 100% MSE bandwidth estimates are fairly steady though they dip a tiny bit.